The Ill #1- Inferno! The Daybreaker! Naked Weapon! Mean Girl! Kid Nobody! The world has just been re-awakened to the existence of superheroes...but how, and why? The Benefactor, first of the heroes, changed the world 15 years ago, and now it is being undone! Who is behind it? 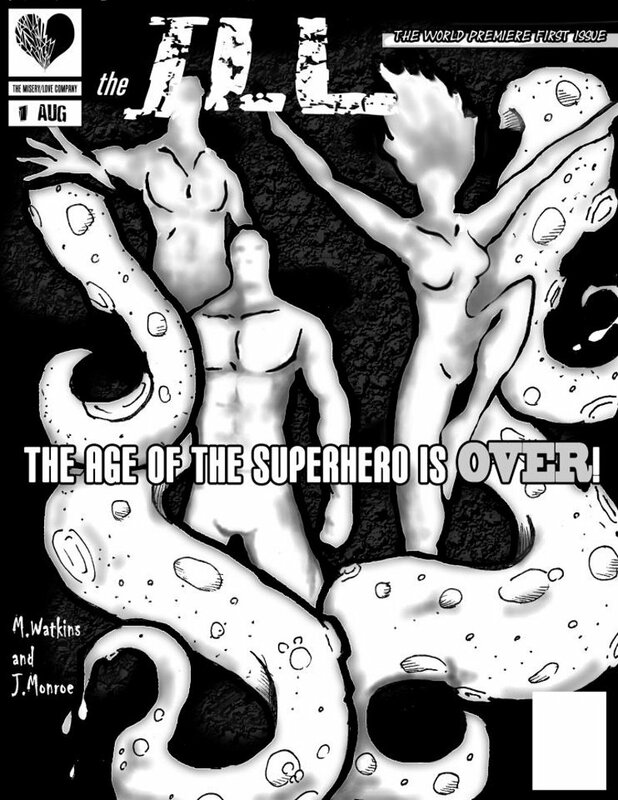 the first of a 31-issue series. The age of super hero's is over? damn it I must have missed it. anyway, you got me interested with your controversial title. Thanks for even bothering to look at it, much appreciated (and I like the stuff you're doing, as well, see my comment on your page). Hope you come back next month, the art improves quite a bit and we get the ball rolling. And all this stuff about 'the end of the age of superheroes' will be wrapped up soon, as we make our way towards the REAL story I want to tell. This is just appetizers. A few people have asked me who the 'J Monroe' is who's credited on the cover of issue #1...he's a talented and tech-savvy old friend who took my scanned in art for that cover, shaded it, and added the words and logo. Very well done. I soon learned the Gimp program myself through the help of another friend, webcomic creator Lee Milewski, and am now doing all the lettering myself (along with the writing and the art, the whole shebang). So now, all blame can be laid at my feet, and my feet alone. I like a lot this cover. The way in which these superheroes are portrayed as faceless silhouettes surrounded by those tentacles is fascinatingly haunting. Thnks, much appreciated! it's one of my favorites, too. Being a friend and a fan of your work for over twenty years, it still amazes me how you weave these elaborate story lines in your head and then unfold them effortlessly in layers. Wish I had the money to pay you what your genius is worth but until then I'll pay you this compliment. Nice. Very kind of you to say, Main...as we've discussed in the past, it's almost as though this stuff is beamed into my head from elsewhere, I don't really have to apply much thought to it. I do jot down notes--important dates in the timeline, names of characters, etc--and sometimes mistakes almost slip through (I'll explain a HUGE one that almost became our next issue soon). Thanks again, brother, and as always, read between the lines--there is much more going on.